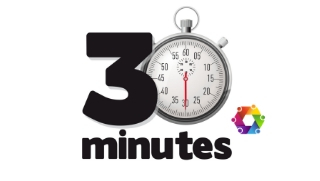 What Can You Achieve In 30 Minutes? I’ve been away with my daughter, we went to the Canary Islands for a few days. It was lovely. We were also disconnected from the internet – mostly – and that leads to old-fashioned things, like reflecting. I’ve been reflecting particularly on what you can achieve in 30 minutes. Get a great chili-con-carne underway and leave it to simmer to create those lovely flavours. Meditate with one of those clever app things – I find meditating hard, the apps seem to help me. Write an article (look, I’m doing it now). Enrol on a course that can change the way you view things and help you concentrate on improving certain areas of your life. Sew on all the buttons that are missing from various outfits that you’ll get round to one day – again a theory rather than something I did. Listen to a podcast – Coffee With The Coaching Revolutionaries, is a good place to start. Record a video and put it on your website or Facebook page. Or you could just save yourself a load of time and go Facebook Live, 3 or 4 times! Make a pot of tea, or coffee and just sit. Create a mind map of something you’ve been trying to get clarity on. Read a couple of chapters of some trashy novel, just because you can (it’s what short breaks are for, right?). Who cares if it isn’t improving your intellect? Write a card to a friend telling them that you miss them and then walk to the post box and actually post it. Cross something off your other to-do list. You know, the household one (change lightbulb etc). Make homemade lemonade. It’s my favourite summer drink. This is a great 30-minute recipe. Prepare yourself something to eat for lunch later. 18. Boil an egg – actually, if you did them consecutively, you could boil 10! 19. Talk to me about your coaching business. Yes, it takes less than 30 minutes of your life to have a chat with me about something that can be life-changing as far as your coaching business is concerned. This is my diary. I look forward to talking to you.